Physiologic end points for fluid resuscitation in septic shock patients with acute kidney injury (AKI) have been undertaken in randomized studies using the Early Goal-Directed Therapy (EGDT) approach. These studies have demonstrated a beneficial effect on in-hospital mortality with EGDT. The Saline versus Albumin Fluid Evaluation (SAFE) randomized study in critically ill patients demonstrated no difference in survival when saline versus albumin solutions were used for resuscitation. However, a benefit of albumin has been demonstrated in a randomized study on renal function and survival in cirrhotic patients with spontaneous bacterial periotonitis. On the other hand, recent observational studies have shown a correlation between fluid overload and mortality in AKI patients whether or not they necessitated dialysis. Moreover, the Adult Respiratory Distress Syndrome (ARDS) network performed a randomized study in critically ill patients to compare liberal versus conservative fluid administration. The liberal fluid administration group exhibited worse pulmonary function and no protection of renal function. Constancy of central venous pressure (CVP) measurements in the 12-mmHg range were observed in the liberal fluid group despite a mean increase in positive fluid balance of 7 L, thus suggesting increased interstitial fluid accumulation leading to pulmonary congestion. The review presented here discusses these various aspects of fluid administration in critically ill patients, particularly those with AKI, and indicates the potential deleterious effects of fluid overload on lung, heart, and kidney function that could contribute to increased mortality. Fluid administration is frequently necessary to stabilize the patient with severe sepsis or septic shock. Moreover, sepsis has been reported to account for approximately 50% of patients with acute kidney injury (AKI) in intensive care units (ICUs) (1). Thus the timing and type of fluid administered as well as renal outcomes are very important. Recently, the timing of the fluid administration and the physiologic end points to be monitored have emerged as Early Goal-Directed Therapy (EGDT) (2). In the patient with septic shock, early intervention with fluid resuscitation within the first 6 hours in the emergency department (ED) has been described as EGDT. Previous studies had generally reported results relating to later interventions in ICUs after admission from the ED. The predefined physiologic goals of EGDT within 6 hours of diagnosis are mean arterial pressure ≥ 65 mmHg, central venous pressure (CVP) between 8 and 12 mmHg, improvement of blood lactate levels, central venous oxygen saturation > 70%, and urine output ≥ 0.5 ml/kg/h. The first randomized study to test this protocol-driven approach was undertaken in patients with systemic inflammatory response syndrome criteria: systolic blood pressure ≤ 90 mmHg or lactate ≥ 4 mmol/L, central venous oxygen saturation < 50%, and mean serum creatinine 2.6 mg/dl. Compared with the control group receiving standard emergency care, the EGDT group received more fluid, blood transfusions, and inotropic use with dobutamine. The physiologic parameters were improved in the EGDT group during the first 6 hours (Table 1). Moreover, the primary end point of in-hospital mortality was less in the EGDT group (30.5 versus 46.5%, P < 0.009). Other physiologic parameters were also improved during hours 7 to 72 (Table 2). Of note, although more fluid was administered from 0 to 6 hours in the ED, the EGDT group received less fluid during hours 7 to 72 and fewer of these patients were on mechanical ventilation (2.6% versus 16.8%, P < 0.001). This initial study did not specifically examine AKI but examined multiple organ functioning scores (Acute Physiology and Chronic Health Evaluation II and Simplified Acute Physiology Score), which were improved with EGDT. However, in another study AKI was improved in the patients randomized to EGDT (3). Subsequent randomized studies have supported this protocol-driven approach in sepsis (4–6). The beneficial effect of this EGDT approach was subsequently shown in septic patients transferred from the medical ward, rather than the ED, to the ICU (3). Thus this protocol-driven supportive therapy is now the mainstay of “Surviving Sepsis Guidelines.” In addition to the generalized inflammatory and microcirculatory effects of sepsis involving cytokines, chemokines, proteases, and procoagulant factors, a recent study suggests a more direct effect on the kidney. The brush-border membranes of the tubular epithelial cells were found to express the toll-like receptor 4, which is the receptor for endotoxin (i.e., lipopolysaccaride) (7). The significant decrease in fibrin split products with the EGDT intervention might suggest a beneficial effect on these events (Table 2). This protocol-driven approach also has been applied after major surgery in high-risk patients (i.e., emergency surgery, preoperative comorbid illnesses, and age >60 years old) (8). In a recent meta-analysis of this approach using specific physiologic goals, postoperative AKI was reduced (9). The Saline versus Albumin Fluid Evaluation (SAFE) randomized, double-blind trial in medical and surgical ICUs in Australia and New Zealand compared resuscitation in 7000 critically ill patients with normal saline versus 4% human albumin (10). 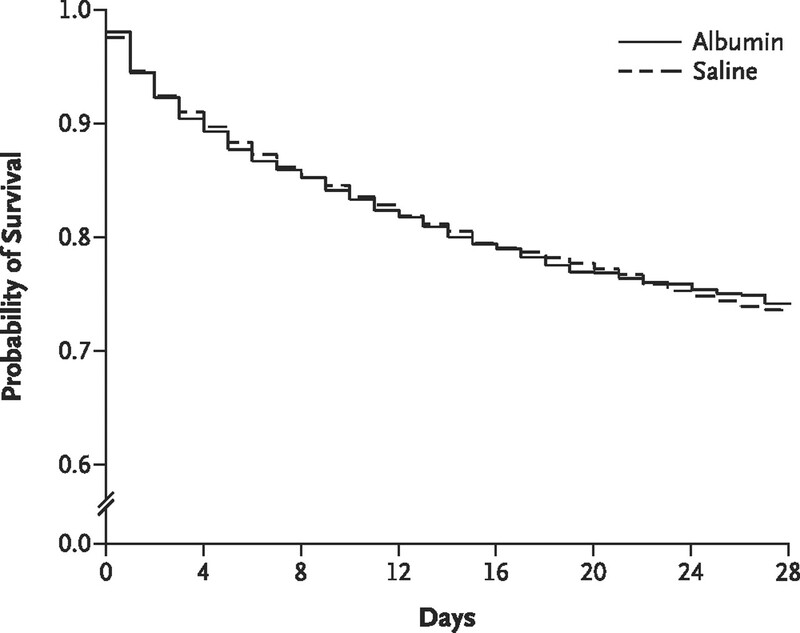 The study demonstrated that albumin was safe, but there was no difference in 28-day survival between saline and albumin administration (Figure 1). There were also no differences in number of days spent in the ICU or hospital, and the days on mechanical ventilation were also comparable. Because isotonic saline or Ringer lactate is less expensive than albumin, the consensus has emerged that isotonic crystalloid solutions should be the preferred resuscitation fluid in critically ill patients. However, there are some results from the study that might give some pause to this conclusion. A subanalysis in the SAFE study of patients with severe sepsis demonstrated better relative risk with albumin (0.87 confidence interval: 0.74 to 1.02; P < 0.09), but the difference did not reach statistical significance. Survival comparison between patients assigned to receive albumin and those assigned to receive saline. Reprinted from reference 10, with permission. There was also a small randomized study in hypoalbuminuric patients (<3.0 g/dl) in which albumin improved sequential organ failure assessment (SOFA) compared with saline (11). Furthermore, in cirrhotic patients who develop spontaneous bacterial peritonitis, a randomized study compared antibiotic alone (cefatoxine) versus the same antibiotic plus albumin (1.5 g/kg immediately on diagnosis, then 1 g/kg on day 3) (12). 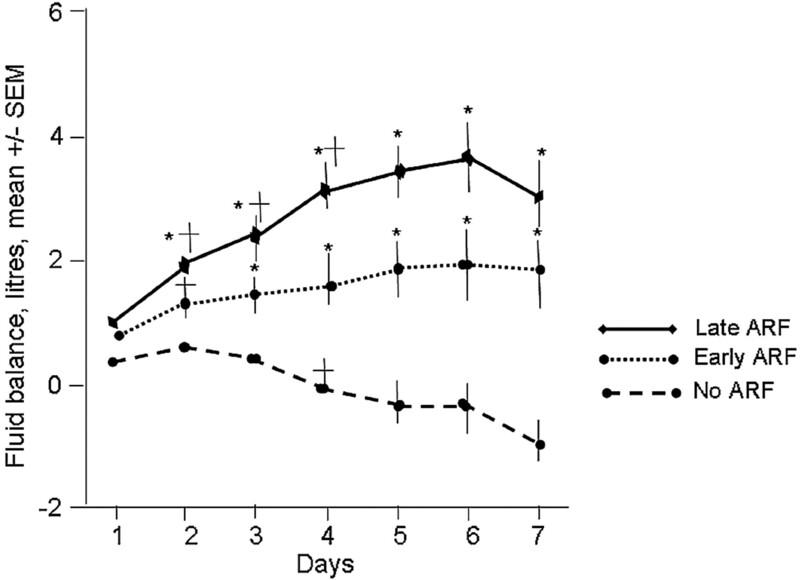 The addition of albumin therapy decreased renal failure and improved survival (Table 3). This approach is now standard of clinical care. There is relevance of these results to the septic patient because sepsis and cirrhosis exhibit hyperdynamic circulations with neurohumoral activation and spontaneous bacterial peritonitis is a type of sepsis. However, no study has compared albumin versus saline in antibiotic-treated septic patients. Therefore, there is the need for a large randomized study to compare human albumin versus saline resuscitation in patients with severe sepsis or septic shock. Hydroxyethyl starch (HES) is a less expensive colloid alternative for albumin; however, HES has negative effects on coagulation and causes an “osmotic nephrosis” that can lead to renal impairment (13). An initial randomized trial compared HES versus gelatin and found a greater incidence of AKI with HES (14). In another study, a 10% pentastarch solution, a low-molecular-weight HES, was compared with modified Ringer's lactate for fluid resuscitation in patients with severe sepsis (15). The HES group exhibited a significantly higher rate of AKI. A review of randomized trials using HES for fluid management demonstrated a 2-fold increased risk of AKI compared with crystalloids (16). Thus, in septic and critically ill patients the use of HES for fluid resuscitation is contraindicated. Although early fluid resuscitation is frequently necessary in patients with severe sepsis or septic shock, several observational studies have demonstrated a correlation between fluid overload and mortality in critically ill adults and children with AKI (17–19). A recent prospective, multicenter observational study of 618 critically ill patients examined the effect of fluid overload (20). Fluid overload was considered an increase in body weight of over 10%. At the time of AKI diagnosis, the patients with fluid overload had more respiratory failure (86% versus 55%, P < 0.0001), more mechanical ventilation (32% versus 65%, P < 0.0001), and more sepsis (22% versus 39%, P < 0.0005). The mean arterial pressure values were comparable (78 versus 76 mmHg, NS) in the groups with and without fluid overload. In those AKI patients with >10% increase in body weight, there was an associated increase in mortality at 30 days (37% versus 25%, P = 0.02), 60 days (46% versus 32%, P = 0.006), and at hospital discharge (48% versus 35%, P = 0.01) after adjusting for severity of illness. Moreover, in those AKI patients who were dialyzed, the survivors had a significantly lower level of fluid accumulation at initiation of dialysis and at dialysis cessation than the nonsurvivors. Furthermore, a highly significant correlation was observed between mortality and the proportion of days in which fluid overload was present (P < 0.0001). The mortality rate correlated with percentage fluid gain in patients not dialyzed and those dialyzed (Figure 2). After adjustment for severity of disease, AKI patients with fluid overload at the time of peak serum creatinine also were less likely to recover renal function than those AKI patients without fluid overload (35% versus 52%, P = 0.007). Mortality rate by final fluid accumulation relative to baseline weight and stratified by dialysis status. Reprinted from reference 20, with permission. There was another multicenter prospective study that examined the relationship between fluid accumulation and survival. Specifically, the percentage fluid accumulation at initiation of continuous renal replacement was significantly lower in the survivors (14.2% ± 15.9% versus 25.4% ± 32.9%, P = 0.03) (21). 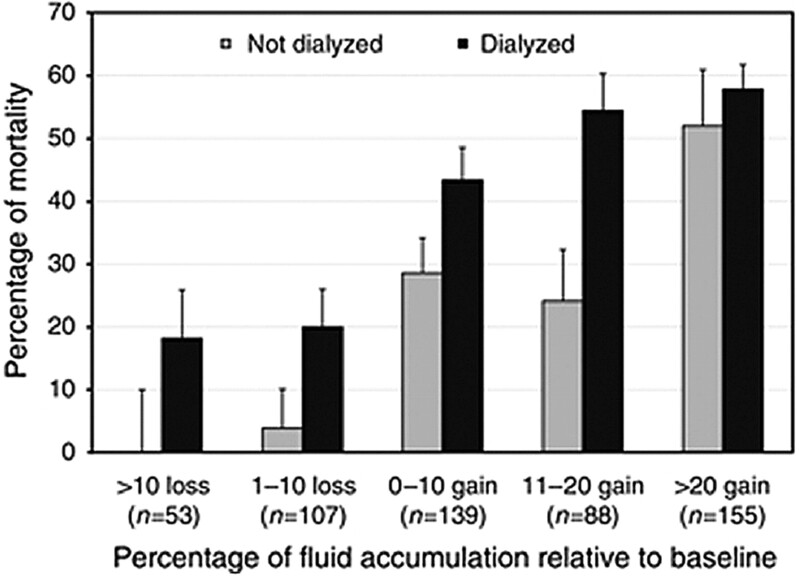 Although the greater fluid overload may have been responsible for the above increased mortality in AKI patients, whether dialyzed or not dialyzed, this conclusion cannot be established in an observational study. This is particularly true because those patients with fluid overload had higher Acute Physiology and Chronic Health Evaluation III and SOFA scores. Thus, fluid overload might be a marker, rather than a pathogenetic factor, in these critically ill patients with AKI. Alternatively, the fluid overload patients may have had higher severity scores because of the excess fluid. A recent analysis of data from the Sepsis Occurrence in Acutely Ill Patients, a multicenter observational cohort from 198 ICUs in 24 European countries, was undertaken to analyze the difference between those patients who did and did not have acute renal failure (22). Of the 3147 patients, 1120 (36%) had AKI at some time while in the ICU. The 60-day mortality rates were 36% in the AKI patients and 16% in the patients without AKI (P < 0.01). The AKI mortality was highest in those patients with oliguria (<500 ml/d) and those who needed renal replacement treatment (RRT). The AKI patients had higher SOFA scores and Simplified Acute Physiology scores than the non-AKI patients. In patients with AKI, mean daily fluid balance was significantly more positive than among nonsurvivors (0.98 ± 1.5 L/24 h versus 0.15 ± 1.06 L/24 h, P < 0.001). Early-onset AKI, defined as onset of RRT within 2 days of ICU admission, was present in 75% of AKI patients and later AKI onset after 2 days in the remaining 25%. Although severity scores in the early-onset RRT were significantly higher than the late-onset RRT, the ICU mortality (39.4 versus 61.5, P < 0.01) and 60-day mortality (44.8 versus 61.5, P < 0.01) were both lower in the early RRT patients. However, as shown in Figure 3, the fluid balance was more positive in the late-onset RRT patients. Moreover, the use of mechanical ventilation was also significantly higher than in the patients with late-onset RRT (93.8 versus 77.9, P < 0.01). Whether the greater fluid balances and mechanical ventilation were factors in the higher mortality in late-onset RRT patients, although suggestive, cannot be determined in this observational study. Time course of the daily mean fluid balance while in ICU. ANOVA for repeated measures: *P < 0.05 pairwise compared with each of the two other subgroups; †P < 0.05 compared with the previous time point. Reprinted from reference 22, with permission. There has been a prospective, randomized clinical trial conducted by the Adult Respiratory Distress Syndrome (ARDS) network comparing conservative and liberal strategies of fluid management for 7 days in 1000 patients with acute lung injury (16). The primary end point was death at 60 days. Of importance, death in patients with acute lung injury is usually due to failure of nonpulmonary organs such as AKI (23). Thus, one potential reason that has been used to support liberal fluid administration in patients with acute lung injury is to protect the kidney. Inclusion criteria for entrance into the study were a ratio of partial pressure of arterial oxygen to fraction of impaired oxygen of less than 300 and a chest x-ray with pulmonary edema. At prerandomization, the conservative and liberal strategy groups had comparable baseline characteristics and similar positive fluid balances of 2655 ± 156 ml and 2875 ± 166 ml, respectively. During the 7-day study, the conservative group received more furosemide and fewer fluid boluses (Figure 4). The cumulative fluid balance at day 7 after randomization was 6863 ml more positive in the liberal, shock-free patients and 7234 ml more positive in the liberal shock-present patients than in the conservative group (Figure 5). Overall, the 7-day cumulative fluid balance postrandomization was minus 136 ± 49 ml for the conservative group and positive 6992 ± 502 ml for the liberal group. Liberal and conservative groups had CVP values of approximately 12 mmHg at randomization. During the 7-day study, the CVP of the conservative group approached 8 mmHg whereas the liberal group remained relatively stable at 12 mmHg (Figure 6). Of interest, the positive fluid balance of the liberal group was comparable to other ARDS network studies (Figure 7) (16,24). Moreover, these findings are comparable to other previous studies (25), thus suggesting that the liberal, not the conservative, fluid approach reflected long-standing clinical practice. 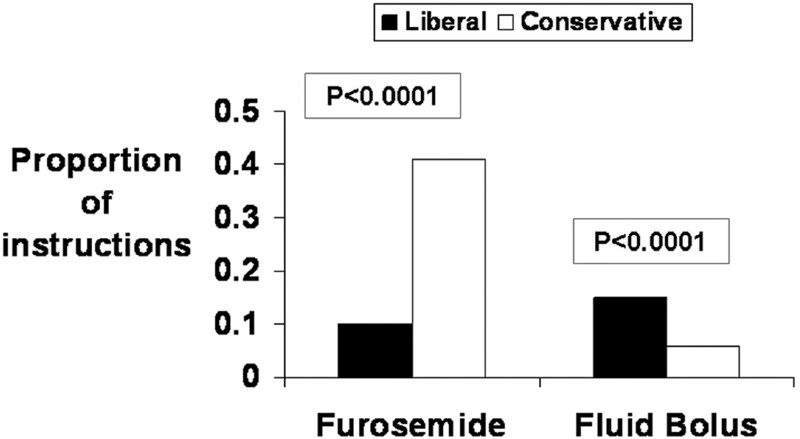 Frequency of furosemide and fluid bolus therapies in liberal versus conservative groups. Reprinted from reference 16, with permission. 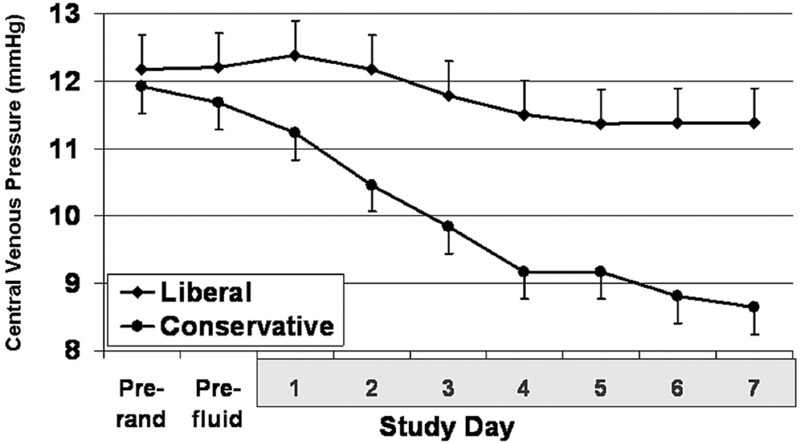 Comparison of cumulative fluid balance at day 7 with baseline between liberal and conservative groups who were (left) shock-free and (right) shock-present. Reprinted from reference 16, with permission. 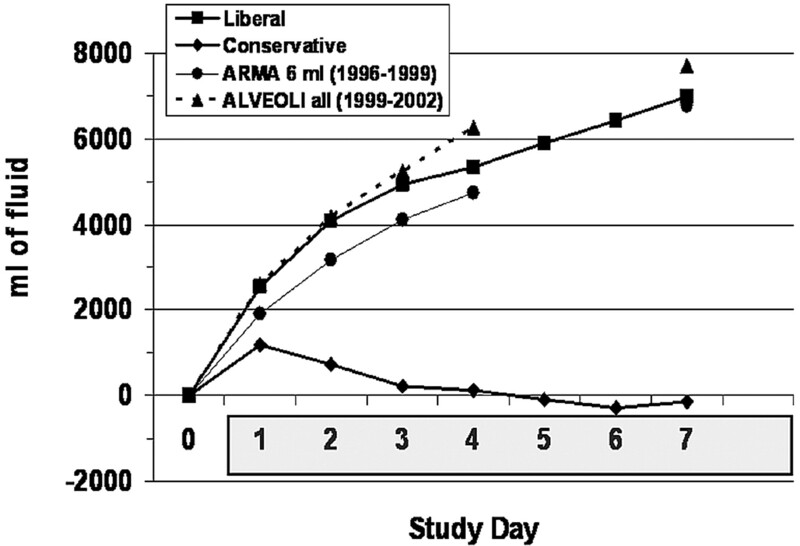 Comparison of cumulative fluid balance in liberal versus conservative groups and previous ARDS network studies (ARMA and ALVEOLI). Reprinted from reference 16, with permission. Stable CVP in liberal fluid group as CVP declines in conservative fluid group. Reprinted from reference 16 and 25, with permission. The results of the ARDS network study demonstrated no difference in 60-day mortality between the conservative and liberal fluid strategies (25.5% versus 28.4%, NS). However, with respect to secondary end points the conservative group demonstrated improved oxygenation index and lung injury score, significantly fewer ventilation-free days (14.6 versus 12.1 days, P < 0.0001), and less days spent in the ICU (13.4 versus 11.2, P < 0.001). The worsening of lung function in the liberal group was not compensated for by protection of renal function. In fact, the use of dialysis in the first 60 days was less in the conservative fluid group (10 versus 14%, P = 0.06). Taken together, the results of this large randomized study favored the conservative fluid approach for critically ill patients with acute lung injury. With the several retrospective and prospective observational studies that indicate that fluid overload is an independent and important factor associated with mortality in critically ill patients, particularly if they have AKI (17–22), the question arises about the mechanism whereby fluid accumulation could be a pathogenetic study in AKI mortality. In this regard, there are several pathways whereby excessive fluid accumulation could directly contribute to death in patients with AKI. First, the distribution of administered fluid must be considered in critically ill patients, particularly if they have sepsis. Experimental studies have demonstrated that systemic arterial vasodilation, as occurs with sepsis, is associated with alterations in Starling forces and an increase in albumin distribution space that favor distribution of administered fluid into the interstitial space (26). Of interest in that regard, in the previously discussed ARDS network study the liberal group did not increase the CVP measurement of 12 mmHg despite an approximately 7-L increase in positive fluid balance (Figure 6). Moreover, large increases in body weight from admission caused by excessive fluid administration are frequently ignored based on an “adequate” CVP in the range of 12 mmHg. With increased pulmonary interstitial fluid during fluid administration, hypoxia is a frequent sequela. The septic patient is then diagnosed as having ARDS and placed on mechanical ventilation. However, there are frequently clinical results that do not support the “stiff lungs” normally associated with ARDS. These patients frequently exhibit normal lung compliance and in others impaired pulmonary compliance can be reversed with fluid removal. This is important because mechanical ventilation has been shown to be an important independent factor for mortality in AKI patients (1). At least one reason is that patients with prolonged mechanical ventilation are predisposed to pulmonary infections, and infection is the leading cause of death in patients with AKI. As suggested, patients with AKI fluid overload, hypoxia, and on mechanical ventilation actually may not have ARDS. In addition to normal lung compliance, judicious removal of fluid with ultrafiltration (which leads to improved pulmonary edema, better oxygenation, and stable hemodynamics) supports the phenomenon of pseudo-ARDS (27). However, fluid removal in these patients is frequently overzealous and is removed faster than interstitial fluid can be mobilized into the circulation. Hypotension then results, and the false conclusion is made that the patient cannot tolerate fluid removal and therefore must have ARDS. 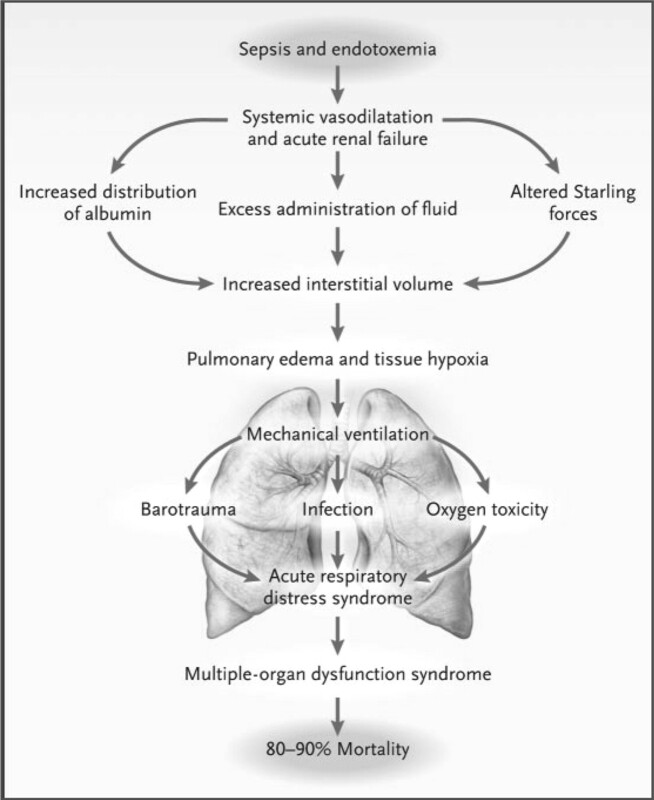 Thus, fluid overload and mechanical ventilation persist and ultimately bona fide ARDS may occur (Figure 8). Events in sepsis and endotoxemia leading to pulmonary edema, hypoxia, mechanical ventilation, ARDS, and high mortality. Reprinted from reference 28, with permission. The lungs are not the only organ system that can contribute to morbidity and mortality in the fluid overloaded patient with AKI. Increased cardiac preload secondary fluid overload may lead to substantial cardiac dysfunction (27). Specifically, resultant cardiac dilation with fluid overload may lead to increased ventricular wall stress and functional mitral insufficiency. The occurrence of pulmonary hypertension can also be associated with functional tricuspid insufficiency and diastolic dysfunction can worsen. Such impaired cardiac dysfunction may be associated with impaired or delayed recovery from AKI. In addition to the potential deleterious effects of fluid overload on pulmonary and cardiac function in the patient with AKI, an increase in renal venous pressure can also impair kidney function and contribute to morbidity and mortality by delaying AKI recovery (28); that is, the longer the duration of AKI, the higher the mortality. An increase in renal venous pressure with fluid overload decreases renal arterial perfusion, increases interstitial pressure, and activates the renin-angiotensin system. Abdominal compartment syndrome has been described with excessive abdominal fluid and impaired renal function, which worsens renal function (29). Thus, there are several effects of fluid overload involving pulmonary, cardiac, and renal functions that can contribute to the high mortality in AKI. The suggestion that early dialysis may improve survival in AKI may be due to avoidance or early removal of excessive fluid administration; however, this remains to be proven. In conclusion, early protocol-designed fluid resuscitation may prevent the occurrence of AKI, particularly in patients with severe sepsis and septic shock. The preferred evidence-based resuscitation fluid is a crystalloid solution. However, prospective, randomized studies are needed comparing saline versus albumin in septic shock. Persistent fluid overload in AKI patients may lead to hypoxia, mechanical ventilation, ARDS, and increased mortality. Judicious fluid removal, which does not exceed the rate of interstitial fluid mobilization, may improve survival in AKI patients secondary to improved pulmonary, cardiac, and renal function. A prospective, randomized study is needed to compare the effects conservative versus liberal fluid administration on mortality in patients with AKI. Is It Time to Evolve Past the Prerenal Azotemia versus Acute Tubular Necrosis Classification?